Across the nation, public and private land boundaries, formerly stored in file cabinets, are being converted to open, accessible digital GIS records. The responsibility for ensuring that this work is done properly and efficiently is rightfully distributed across local, state, tribal, and national organizations. 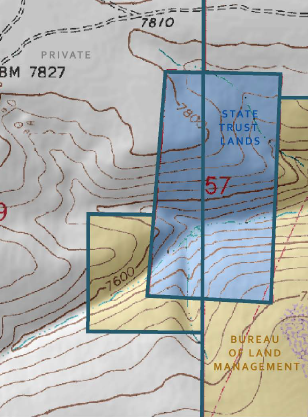 Critical land boundary-related GIS map layers include surveyed property markers, the public land survey system (the township and range system) and other state survey systems from which all legal descriptions are formed, public and privately owned parcel boundaries, and public lands boundaries including areas of administration and designation for lands managed at the federal and state levels. Agree to core federal land ownership data requirements common across land owning federal agencies. Additionally, programs and services that provide improved locational and measurement precision from GPS need to be adequately deployed and supported. These services, such as the National Geodetic Survey's Continuously Operating Reference Stations (CORS) program or state and regional Real-Time Kinematic (RTK) networks, ensure that surveyors and mappers create new land ownership map data correctly and efficiently. In this century, the quality of the GIS data depicting land boundaries and other physical assets is a good quick initial measure of the capabilities of a land management agency. The federal government ought to know (and make accessible) just what land it owns. And more than 15 years after the GPS signal was unscrambled for civilian use, federal agencies should be expected to have adapted away from arcane, siloed records management to instead provide accurate, precise GIS map layers of their land boundaries that integrate with local ownership data to form a true national asset to citizens and business.